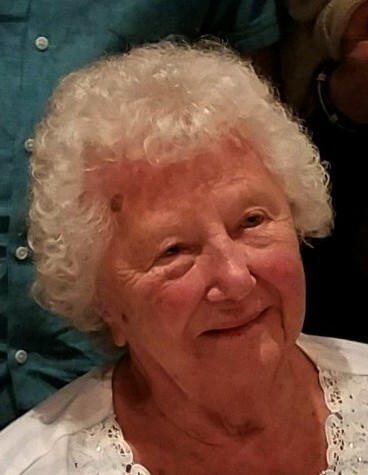 Obituary for Helen T. Soulea | Bronson & Guthlein Funeral Home, Inc.
Helen T. Soulea of East Brunswick, NJ passed away peacefully on April 5, 2019 at Sunrise of East Brunswick. She was 95 years old. Born in East Brunswick, Helen was a resident of Milltown, NJ for 92 years. Helen was employed for over 25 years as a bookkeeper by Frazer Evangelista & Co., CPAs She was a member of St. Paul’s Church, Milltown, NJ. She was a skilled gardener, loved all manner of dancing, German music, world travel, and never missed a chance to enjoy the fun things in life. Helen was an exceptionally loving mother, grandmother, and great-grandmother. Predeceased by her beloved husband of 69 years, Clarence in 2011; Helen is survived by daughter Nancy Soulea of Somerset, NJ; daughter and son-in-law Lois and Paul Fromer of East Brunswick; daughter and son-in-law Connie and Joseph Marcantonio of Jackson, NJ; grandson Matthew Fromer and his wife Jaqui of Morganville; grandson Christopher Marcantonio of Jackson, NJ; and great-grandchildren Caleb and Kai Fromer. The family offers special thanks to all of Helen’s friends and staff at Sunrise of East Brunswick who brought much joy to her later years. Family and friends will be received Sunday 4-7pm at the Bronson and Guthlein Funeral Home of Milltown. The funeral service will be celebrated Monday 10am at the funeral home followed by interment at Van Liew Cemetery, North Brunswick, NJ. In lieu of flowers, the family kindly asks memorial donations be made to St. Jude Children’s Research Hospital.